↑ 1.0 1.1 1.2 1.3 1.4 "Iron Sheik WWE Hall of Fame Profile". WWE. สืบค้นเมื่อ 2011-03-31. ↑ 2.0 2.1 Ellison, Lillian (2003). The Fabulous Moolah: First Goddess of the Squared Circle. ReaganBooks. p. 163. ISBN 978-0-06-001258-8. ↑ "After Addiction and Tragedy, The Iron Sheik Gets Back Up off the Mat". Bleacher Report. สืบค้นเมื่อ November 14, 2017. ↑ 4.0 4.1 4.2 4.3 4.4 4.5 "Iron Sheik Profile". Online World Of Wrestling. สืบค้นเมื่อ September 20, 2008. ↑ Greenberg, Keith Elliot (August 14, 2013). 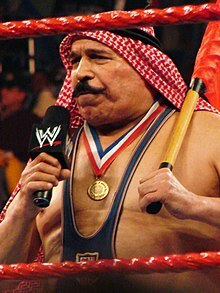 "After Addiction and Tragedy, The Iron Sheik Gets Back Up Off the Mat". bleacherreport.com. สืบค้นเมื่อ January 11, 2016. ↑ "Superstars - Hall of Fame - The Iron Sheik - Bio". WWE. 2013-05-27. สืบค้นเมื่อ 2013-05-31. ↑ 7.0 7.1 Royal Duncan & Gary Will (2000). Wrestling Title Histories (4th ed.). Archeus Communications. ISBN 0-9698161-5-4. ↑ "PWInsiderXTRA.com". www.pwinsiderxtra.com. สืบค้นเมื่อ 2018-02-01. Flair, Ric & Greenberg, Keith Elliot. Ric Flair: To Be the Man. New York: Pocket Books, 2004. Meltzer, Dave. The Wrestling Observer's Who's Who in Pro Wrestling. Turlock: Pro Wrestling Observer Newsletter, 1986. Greatest Wrestling Stars of the 1980s, WWE Home Video, 2005. หน้านี้แก้ไขล่าสุดเมื่อวันที่ 20 กรกฎาคม 2561 เวลา 20:29 น.